This interesting illustration was published in 1853, and depicts a KhoiKhoi man riding an ox. (The KhoiKhoi people were formerly referred to as Hottentots by the Dutch settlers in South Africa.) The KhoiKhoi were a cattle-herding people even before the arrival of European settlers. Oxen are castrated male cattle, usually chosen for their large size and strength, used for draft work or (less frequently) riding. They are slower and more sure-footed than horses. Basically the indigenous Khoi-Khoi people of Southern Africa had used their oxen to transport their goods and as riding animals for generations before the arrival of the white man. Zebra carry the horse sickness virus which even today wipes out large numbers of horses, mules and donkeys. Horses were also a rich man's possession which had to be imported and the poor settler farmers had to make use of one animal for milk, meat, hides and transport. The harsh grazing conditions and the tick infestations in the area also take a heavy toll on the non-indigenous livestock. Warlike tribes would ride their cattle into battle with fiery brands tied to their sharpened horns, and settlers would often strap their goods onto the horns of the oxen that they were riding (in one case on record, a batch of piglets in baskets) and travel the 20 or more kilometres into the nearest town to barter. We have trained a number of local Nguni cattle for riding and find most of them to be amenable for wagon work, while a good riding ox needs to be carefully selected from the herd according to his temperament. If you are traveling in South Africa and would like to see for yourself, the Mills' can be contacted via the info on this page. Thanks, Debbie! 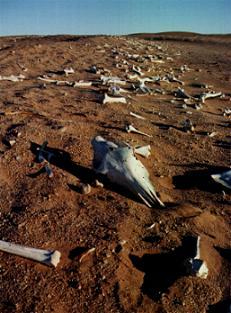 NamibWeb.com, a travel site, has an article uncovering the mystery of a valley full of old horse bones that occasionally appears deep in the desert. Spooky! I wouldn't want to wander into that on a moonlit night! The South African Boer Horse (Boerperd) descends from an interesting mixture of breeds. 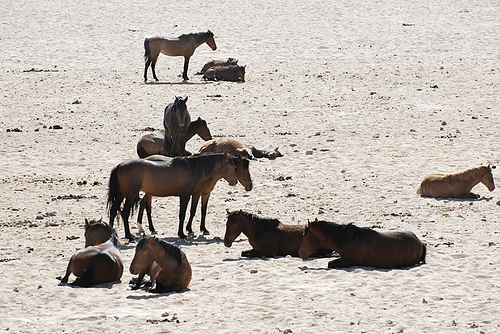 The first horses brought to South Africa by Europeans were Andalusians, Persian Arabs and Java Ponies. These were mixed and selected to provide all purpose horses and cavalry mounts. In the 1800s the blood of Friesians, Norfolk Trotters, Cleveland Bays and Hackneys was added. Today's Boerperd is somewhat variable in appearance, with some horses showing their Arabian or Andalusian ancestry more strongly, and others leaning more towards the Norfolk Trotter, Hackney or Cleveland Bay appearance. As can be seen on this website (look under "Stallions/Hingste") some of the horses are 5-gaited, and shown saddleseat style. 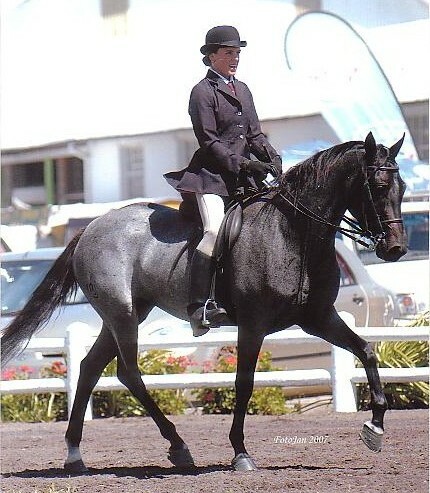 Others are clearly trotting horses with sport-horse conformation, and are used as jumpers or for dressage. Others are used as pleasure horses. Because of the many influences, the Boerperd comes in a variety of solid colors, including roan and dun.